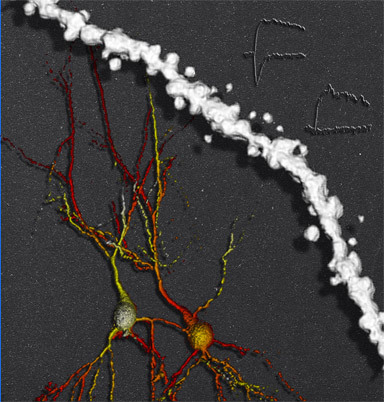 Mouse CA1 hippocampal neurons (shown in shades of red and yellow) and spine (shown in white) are labeled with Alexa Fluor 594 using a patch pipette and imaged using two photon microscopy with 830 nanometer excitation. The traces in the upper right represent the measured current after MNI-caged glutamate is uncaged in different synapses; the upper trace has both NMDA and AMPA receptors whereas the lower trace has only NMDA receptors. I am a post-doc in Dr. Rick Huganir's lab. My research is focused on molecular mechanisms of AMPA receptor trafficking, which has been implicated in synaptic plasticity. Changes in synaptic strength are thought to underlie how our brains acquire and store new information. Understanding the molecular mechanisms which cause changes in AMPA receptor trafficking can lead to further clarification in regards to learning and memory. We use the LSM 510 Meta/NOL with an electrophysiology setup. This allows us to combine two photon imaging and two photon uncaging with electrophysiological recordings to probe functional state of individual dendritic spines. We also use the ZEISS LSM 510 with an Axiovert 200 to perform live imaging on cultured neurons, which allows us to study mechanisms of AMPA receptor trafficking.